Striking color profile transitioning evenly from the blood red center, to ruby red and finally to shocking pink. Ripe red cherry, strawberry, red plum, boysenberry, dulce de leche, dried roses, and pipe tobacco. Black cherry, rhubarb, pistachio, caramel, tobacco, baking spice, cappuccino, and black earth. Wow! Balanced complexity, with a sensuous mouthfeel that coats the palate in three dimensions, unfolding in waves before a crescendo on the finish, long after the wine is gone. There's only one answer to the correct pairing for this wine: Smoked rib sandwich. Full stop. Hurry, Operative! This offer will not last the day. Today's Robert Mondavi Winery 2014 Reserve To Kalon Vineyard Oakville Napa Valley Cabernet Sauvignon is an incredible wine, the likes of which is hard to come by these days. The critic scores on this wine are through the roof, and for good reason. This is one amazing. Peering into the glass, you’ll see a striking color profile transitioning evenly from the blood red center to ruby red and finally to shocking pink. As soon as you stick your nose in the glass you’ll encounter a gorgeous nose replete with notes of ripe red cherry, strawberry, red plum, boysenberry, dulce de leche, dried roses and pipe tobacco. Taking a sip, you’ll be elated as you encounter a diverse flavor profile of black cherry, rhubarb, pistachio, caramel, tobacco, baking spice, cappuccino and black earth. Wow! You get what you pay for, and these masters have clearly honed their craft: You could not ask for more balanced complexity, with a sensuous mouthfeel that coats the palate in three dimensions, unfolding in waves before a crescendo on the finish, long after the wine is gone. There’s only one answer to the correct pairing for this wine: Filet mignon. Full stop. in 1966, Robert Mondavi was a man with a mission. Mondavi had the vision to create the first major post-prohibition winery in the United States. His dream of crafting the best wines in the world has been realized and today the winery is recognized as a global leader in fine wine. It hardly gets much finer than with today’s Maestro, a worthy homage to the master of wine himself. Here's what the wine press has to say. 98 Points, Publisher's Pick - Tasting Panel - _From the most coveted blocks within To Kalon--the treasured vineyard of Robert Mondavi that was the location of his winery home since 1966--this is the fourth vintage of the To Kalon--designated Reserve. Like a classic rock 'n' roll tune from that era, this wine ranks among the most revered and will continue to be memorable for decades. Among the top five songs of 1966 were "Cherish" by the Association and "Soul and Inspiration" by the Righteous Brothers, which are appropriately a good fit for describing To Kalon Vineyard. From its aromas of dark cherry and vanilla spice to its deeply-expressive notes of graphite, leather, plum, and earth, the velvet drapes across the palate from start to finish." 95 Points - Robert Parker - "The 2014 Cabernet Sauvignon Reserve To Kalon is a blend of 88% Cabernet Sauvignon, 8% Cabernet Franc and 4% Petit Verdot. Deep ruby/purple-colored, notes of sweet creme de cassis, blackberry, charcoal and toast are present in the subtle but intense aromatics. The wine is full-bodied and classically crafted, building incrementally on the palate and displaying full-bodied richness, sweet tannin, and a potential to age for 25-30 + years. This is a beauty." 95 Points - Virginie Boone, Wine Enthusiast - "This is made from a majority of Cabernet Sauvignon from the famous historic site, with 6% Cabernet Franc and 1% Petit Verdot. It startles in beauty and grace, with plenty of power and concentration. It's a charismatic wine, bright in red currant and black cherry and a soft, supple texture that holds an underlying grip and toasty oak spice." 94 Points - Antonio Galloni, Vinous - "The 2014 Cabernet Sauvignon Reserve is a model of elegance and classicism. Dark, powerful and intense but also a touch linear in the style of the vintage, the 2014 Reserve hits all the right notes. Readers will have to give the 2014 at least a few years in bottle, but all the elements are in the right place for the wine to develop beautifully over the years and decades to come." 93 Points - James Suckling - "This shows some valley floor dusty texture with blueberry and currant character. Medium body, fine and silky tannins and a fresh finish. Shows the To Kalon magic. Drink in 2019." 93 Points - Decanter - "This vintage's Mondavi Reserve leads with notes of red and black plum, vanilla, dried herbs and pencil shavings; the prelude to a supple, open-knit palate with a good core of juicy fruit and tangy acids. There is a touch of oak tannin which will need some time to integrate further." 92 Points - Wine & Spirits Magazine - "Supple and heady with the richness of Oakville cabernet, this is a plush, espresso-scented red. Associate Editor Geoff Millar described it as an "oak rocket with dark fruit inside," the oak propelling the fresh raspberry and blackberry flavor. Winemaker Genevieve Janssens selects this wine from the vineyard that surrounds the winery, working with a range of blocks for this Reserve, including vines dating to 1974." 90 Points - James Laube, Wine Spectator - "Offers aromas of dusty berry, plum and currant, with crushed rock and graphite notes amid cedary oak and black licorice details and firm tannins. This is the fourth vintage of our To Kalon Vineyard-designated Reserve. When Robert Mondavi chose the To Kalon Vineyard in west Oakville as the home for his new winery in 1966 he remarked that, “It was a vineyard with a distinguished history and a magical nature. Ideal soils, sunlight, and rain—to my eye, the vineyard was a treasure.” Those sentiments were re-confirmed when the To Kalon Vineyard was named the Vineyard of the Year by the California State Farm Bureau in 2011. Our Reserve is blended from the finest blocks within To Kalon. 2014 started with worrisome, drought-like conditions, and many feared a parched, dry spring as in 2013. Refreshingly, spring rains came in February and into March providing water for the soils and filling reservoirs. The wine growing season will most be remembered for the August 24th earthquake that occurred just as harvest was commencing in the Napa Valley. The vines were not affected and harvest finished early, bringing in beautiful, healthy fruit. Our specially selected grapes for the Reserve cabernet sauvignon were picked between September 6th and October 8th. The grapes were hand-harvested with three stages of strict sorting: first, on the vine, then by individual clusters, and then again by single berry following de-stemming. The selected grapes went directly into traditional French oak tanks for cold soak, fermentation and extended maceration – a total of 35 days of wine to skin contact – maximizing the extraction of varietal character and complexity while keeping the tannins round and supple. The new wine was drained and gently pressed into 100% new French-oak barrels for malolactic fermentation, assuring seamless integration of fruit and oak. The final blend was assembled through repeated tasting trials over nineteen months of barrel aging. The wine was bottled in August of 2016. 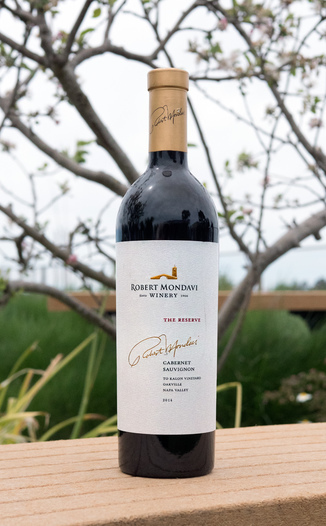 98 Points, Publisher's Pick - Tasting Panel - From the most coveted blocks within To Kalon--the treasured vineyard of Robert Mondavi that was the location of his winery home since 1966--this is the fourth vintage of the To Kalon--designated Reserve. Like a classic rock 'n' roll tune from that era, this wine ranks among the most revered and will continue to be memorable for decades. Among the top five songs of 1966 were "Cherish" by the Association and "Soul and Inspiration" by the Righteous Brothers, which are appropriately a good fit for describing To Kalon Vineyard. From its aromas of dark cherry and vanilla spice to its deeply-expressive notes of graphite, leather, plum, and earth, the velvet drapes across the palate from start to finish." 90 Points - James Laube, Wine Spectator - "Offers aromas of dusty berry, plum and currant, with crushed rock and graphite notes amid cedary oak and black licorice details and firm tannins."